I am up for a happier more empathic society. A diverse range of happier, healthier and empathic cultures. I wouldn't call it evolution, I'd call it a healing. We live in a wounded Political society that is in denial. This is painful. Healing is very much a natural part of life, and nature tends to support healing rather than block it. Using the word evolution sort of justifies the existence of this hierarchically violent system and all it's horrors over such a long time as part of the 'natural flow of things'. Yet we know that there have been many diverse cultures where empathy was at the heart of how they organised themselves. Is this not also part of the natural healthy expression of being human, biologically speaking? Beating a child to terrorise and control the child can hardly be called 'the natural order of things' yet during the past 6 centuries in Europe it was the traditional approach, just as leaving infants to cry it out to go to sleep is not the 'natural order of things'. Google the phrase 'poisonous pedagogy' and find out more. Nor is a 'revolution' where the oppressed engage in organised violence to beat the oppressors to terrorise and control them, any better. Cuba has some merits, yet it also shows signs of unresolved trauma. What we see in the middle east is that peaceful thoughtful movements have all been undermined by the introduction of violence on their 'side'. It hasn't worked in terms of delivering better,healthier and more empathic political socialism systems. Were the Middle Eastern Springs 'evolutions', revolutions or just the result of a more well informed empathy, being expressed by large numbers of people seeking a healing, a healthier society? Attack the man, avoid the discourse. None of us KNOW anything about him other than his media career, and the issue here is he is saying things we know are basically true on a public funded forum that refuses to admit those truths. So the issue is what we need to discussing. And that issue is HOW, in practical terms, can we shift Power from a Centralised Executive to the grass roots? Do you have any practical suggestions on this, or insights? And would you like to share them? It's frustrating to observe the manner in which people are talking about Russell Brand, and not the issue we all face. His comments are relevant, even if they are incomplete. So here's my current take on the situation we are faced with. 1. Voting for people or Political Parties who, once in positions of Power, act in the interests of Power, irrespective of the mandate they sought during the election or claimed once in Office is not a genuine democracy. If one votes under the current system, one has conceded consent to whatever those 'elected' do, even if they do different to their election manifesto, even if what they do harms you. The only people who are not ruled by consent, are those who DO NOT VOTE. Their voices are censored because they refuse to submit to the intellectually morbid system of electoral politics currently in place. They are castigated and chastised for their refusal to play the game whose rules the comprehend as being biased towards Power, away from the people. In other words, the VOTING people of the UK, by the very act of legitimising Governance as we know it, consented to the Iraq and Afghan Wars, to the bail-outs of the banks, to the austerity cuts because the act of voting as it stands is merely a fig leaf for Centralised Power to RULE, which continues to behave as it has ever done. 2. Democracy if it is to be fully realised requires that citizens have a direct and active role in those decision making processes that affect their lives. This has been rejected by the Political Classes out of hand. 3. The Power Inquiry of 2006 addressed this very issue in some detail, and it's findings revealed that many, many more people were, and are engaged in community and voluntary work that has an effect BECAUSE the of futility of voting under the current system. That is not apathy. That is working around an adverse situation to bring benefit to their communities and to all communities. David Cameron called the Power Inquiry 'impractical'. Then he and his advisor's, recognising the threat implicit in the Power Inquiry Report, sought to undermine that voluntary and community action, and the political awareness it represented, by de-funding councils which lead to defunding of voluntary and community action, and by privatising aspects of it to replace those voluntary services with for-profit services. Had Labour been in Power, they would have done pretty much the same, as they bailed out the banks when it was not necessary. None of the parties in power had much concern for the people of Iraq, much less have they any real concern the most vulnerable people in the UK, including our children. 4. The sheer frustration of activists who have access to information on the issues we all face that can be checked, tested and verified and to which Power, if it was being exercised for the peoples benefit, SHOULD respond with appropriate action, yet does not, is intense. 5. So I urge that people write about actions that have taken place and actions that we can take that can have an effect, rather than criticise a public face, Russell Brand, who makes commentary. 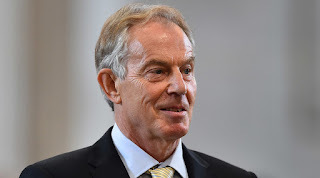 For example, WHY is Tony Blair a free man? His actions transgressed International and National Law, as well as being immoral. The same applies to the NATO bombing of Libya, which he and supported fully, and David Cameron actioned, and would also have applied had Cameron succeeded in his attempts to garner support for the bombing of Syria. Had these Laws been more properly studied and understood, perhaps the population of the UK could have acted in a way that might have prevented those wars from being pursued by the UK Government at the very least. 7. Young people SEE what is happening, they understand the harm and pain so many people are suffering and that these harms are AVOIDABLE and wonder why their elders are so ineffective, so feeble, in the face of avoidable calamities. Russell Brand understands this.. and this is what he was talking about - people want Power because we are intelligent, empathic and very well educated as to how the world works, and we feel the need to change that by direct participation. We want to be able to construct laws and have full oversight of Governance. And this is both reasoned and rational.